The Japanese company Citizen has been the leader for years in the development and manufacture of micro-mechanical and micro-electronic products. Along with manufacturing machine tools, office machines and CNC devices, the business sector for professional products also encompasses primarily various printer series. 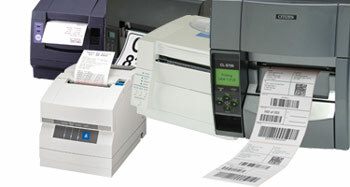 As official distributor for label and POS printers from Citizen, Jarltech offers you innovative and aggressively priced devices with many unique characteristics for demanding users. For decades, the POS printers from Citizen have been well known and liked on the market. Over 40 years of experience flows into the printer series, which will impress you as reseller in your respective market segment with real innovations and exceptional features specially protected printers for industrial and gastronomic surroundings, exceptionally fast and robust POS printers, or printers for especially wide receipts with high information density are a few of the unique products from Citizen. Citizen also plays a significant role in the production and development of printers for labels, foils, tickets and similar materials. The Citizen printer systems have made their mark in space-saving desktop printers for shipment or production labels, to high performance printers for extremely demanding applications in industry and logistics. Professional printer systems support the most diverse processes in industry, logistics and commerce. Downtimes or delays caused by malfunction or operator error could be catastrophic for applications such as check-in at the airport, just-in-time logistics, or highly frequented cashier stations in retail. Along with the extremely high reliability, Citizen printer systems offer their customers an exemplary user-friendliness and especially sophisticated handling. With combined sales of approximately 2.15 bn Euros, Citizen is a strong partner with optimal development, production and service processes. As official distributor, Jarltech offers you not only products overnight and first-hand support, but also replacement parts and rapid repair of Citizen receipt and label printers.